Candy Lipsticks - Fruit flavour compressed-candy sweets in a lipstick case - made by our pals at Swizzels, and one of our most nostalgic sweets from the 70s. Stop Press - Swizzels have changed these to 'Love Hearts Lipsticks' - just the same as bef... More..
Love Hearts - The making (or breaking) of many a childhood romance. The messages may change a bit (I don`t remember "Fax Me" - but then again I don`t think anyone at our school had a fax - and even if they did I don`t think it would have been seen ... More..
Mini Love Hearts - little packs of every romantic`s favourite sweets. The sweets are actually the same size as the normal Love Hearts - it`s just the pack that`s diddy!!! 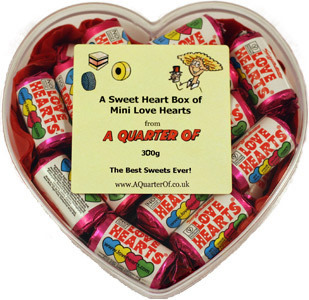 - Qty In Order: a quarter of a kilogram - just over 8.8 ounces... More..
A Sweet Heart of Mini Love Hearts - A fabulously original romantic gift that will make your beloved swoon with delight. Or, it can be used as colourful table decorations at weddings (or favours, if your budget allows!). Each heart measures 14cm (... More..